Inca Secret Blend is the brainchild of Mitchell Orchant, the Managing Director of C.Gars Ltd., the UK’s largest specialist cigar retailer. Joining forces with Ron Morrison, Inca’s Creative Director, and Gennaro Lettieri, who owns Tabacallera del Oriente, the Tarapoto, Peru factory that makes the cigars, he set out to make a Peruvian puro for the international market to go alongside the Inka – yes, with a “K” – that he had already introduced to the UK. “Having been in the cigar retail business for many years, we decided it was time to create our own brand, and we weren’t happy until we found a blend that we were 100% satisfied with, believe us, it’s a lot harder than you may think! We launched Secret Blend cigars to the UK market in 2012 and they rapidly became our bestselling non Cuban cigar brand. We literally can’t import them fast enough to satisfy UK market demand. Our next step in this journey was to adjust the blend and the range for the International market and after a further two years of product development we are finally ready. Ron and Mitchell visited Gennaro in Peru to see the tobacco fields and the cigar factory and test out blend after blend until we were certain we had got our blend right. Gennaro explained that his tobacco is used in many of the big name brands as filler tobacco to sweeten up the blends. So, an entirely Peruvian cigar through and through? I happen to love the cigars I’ve had with Peruvian tobacco in them, so I’m excited to give this one a try. The Inca Secret Blend currently comes in two sizes in an initial limited release: Tambo – 6×50, and Imperio – 6×60, although according to the website, a number of additional sizes are planned for future release. They come in a rather elaborate box in the shape of an Incan pyramid, 20 cigars to a box. Our great friend Craig Vanderslice aka Cigar Craig sent me two of each size a few weeks ago to try out, so big thanks to Craig for giving me the opportunity to give them a go! 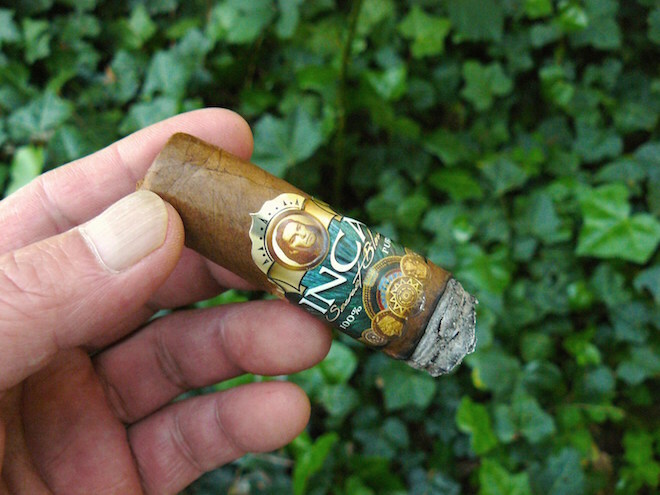 When I pulled the Inca Secret Blend Tambo from its cellophane confines, I was surprised to see that the cellophane was a bit yellowed, so it seems that this newly released cigar has been sitting for a bit. The wrapper itself is a yellowish dark tan with minuscule veins and a nearly seamless roll, leading to a round double cap. This one had an indentation on top – not a big deal, since I will be cutting it off anyway. The band is very distinctive, in dark green, shiny gold, brown, and black with white lettering and a portrait of Tupak Amaru II, the leader of the failed 1780 rebellion against Spanish colonialism. 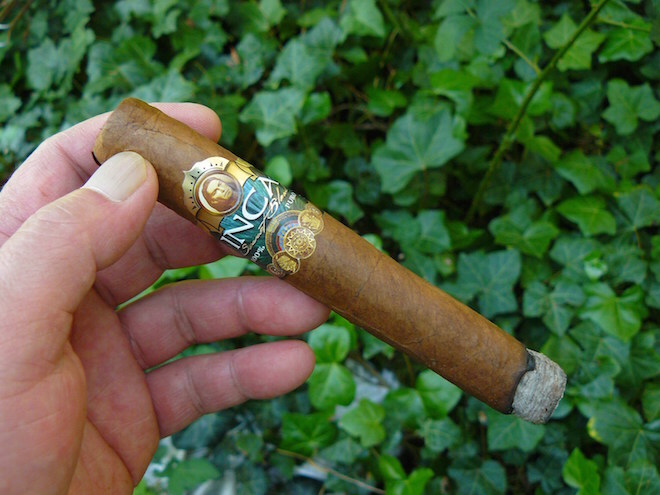 Rotating the cigar around, the backside shows a panel of colorful Incan iconography (perhaps from textiles). The roll of the cigar is a bit soft in spots. Taking a sniff off the wrapper, I pick up light cedar, grass, and earth, while the foot shows tobacco, hay, and light earth. The cold draw after the cut is snug and displays pretty much the same flavors implied in the aromas off the foot. The foot lights easily and flavors of smooth, bright cedar and leather, and light earth in a mild body start off the Inca Secret Blend. Despite the snugness of the draw, the cigar has no problem producing a decent amount of smoke. Grassiness and very slight floral notes hover in the background, and the retrohale reveals a smooth, easy-going pepper. The burn is rather wavy, but the ash looks very solid. An inch in, the pepper has faded away, while the Inca continues to be driven by the cedar, leather, and earth, with backing from a spice note that is simultaneously slightly sweet and a bit savory. 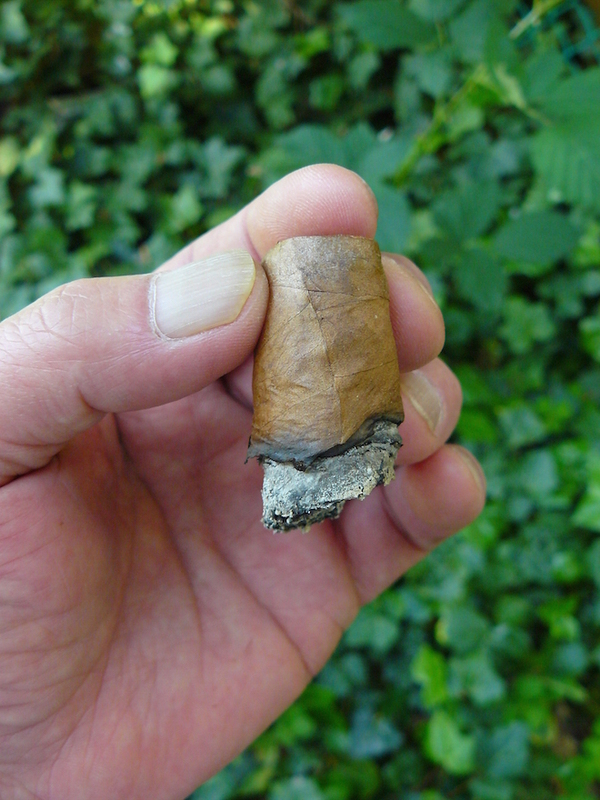 The ash lasts for more than 1-1/2” before falling (in my lap), probably weakened a bit by a needed correction. Entering the middle section of the Inca Secret Blend, the flavors have deepened, while moving into a high-mild body. The leather has backed off considerably to be replaced with some bread and rich tobacco flavors, as the cedar and earth remain at the forefront. A bit of saltiness has also become evident on the palate. Some sharp white pepper has appeared on both the palate and lips, while breadiness and leather have again exchanged places in the mix. Some coffee bitterness and lightly sweet floral spice weave in and out. In the final 1-1/2”, the pepper again backs off and I finally get what I was anticipating all along – a citric tartness to go with the floral spice which continues to a satisfying end, at the lower end of medium in both body and strength. Although the cigar required several corrections, it only required a re-light when I let it sit too long while conversing with my neighbor. Overall, I enjoyed the Inca Secret Blend. It has a nice mix of flavors and pretty good amount of complexity, although it was not quite what I had expected of a Peruvian puro. That is not a bad thing, because in fact, I should not have had allowed myself a preconception of what to expect. I do think that it could use more time in the humidor to correct the admittedly minor burn problems I had that required several touch-ups (although the first one I smoked didn’t have quite as much of a problem with the burn), and to fuse the flavors together a bit more and perhaps bring out more of the inherent sweetness that my personal palate would appreciate. Despite the somewhat erratic burn which did much better in the second half, it’s a well constructed stick. I do think that it’s a cigar well worth looking into for something a little different, especially if you want to see what Peruvian tobacco is all about. 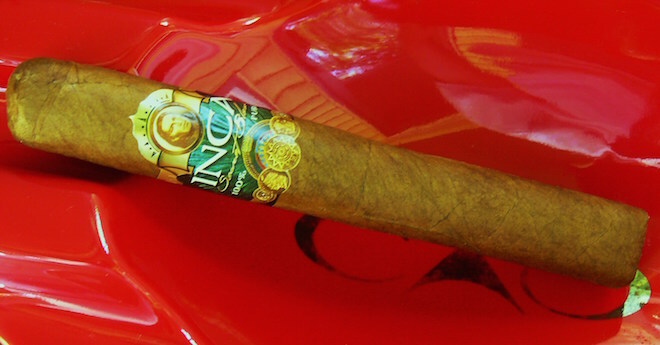 The price may seem somewhat high, but where else are you going to find a cigar that is completely Peruvian? I definitely plan to get ahold of more of these to see how they will fare with more resting time and perhaps at a lower relative humidity. After smoking two of the Inca Special Blends, I decided that something on the lighter side (i.e., not an Imperial IPA or a dark ale) would be the best match-up for it. 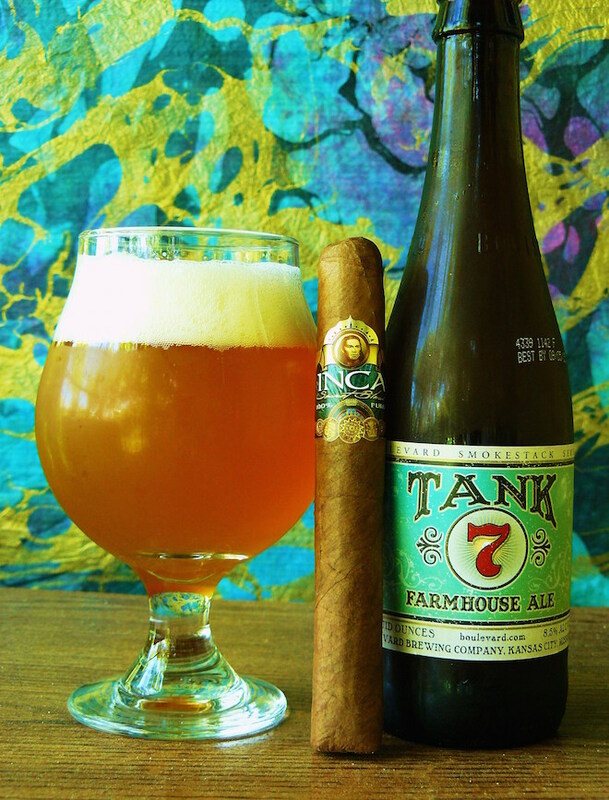 The Boulevard Smokestack Series Tank 7 Farmhouse Ale is an American variation on a Belgian farmhouse that exudes citrusy sweetness in an effervescent entry and a spicy hop finish, and is one of my favorite warm weather refreshments despite its rather hefty 8.5% ABV. Needless to say, it’s a great match for just about any smoke that hovers in the low to mid medium range, but I have to say that after draining my glass and having more cigar to take down, the Weihenstephaner Vitus I poured at the very end was an even better companion to the Inca. The cigar should do best with a sweeter, fruitier beer such as a wheat beer or low IBU Belgian-style beer, a lighter single malt Scotch, or as always, coffee. I’ve gotta try this, just to see what a cigar from Peru is like.